We’d love your help. Let us know what’s wrong with this preview of Grave Error by Majanka Verstraete. Tess and her dog walk through the forest that stretches from their back yard, and run into a strange girl wearing old-fashioned clothes—and the girl is transparent in the sunlight. This strange girl has no memories of her life, her family, her identity—nothing. When they meander into a nearby graveyard, the girl starts to recall details of herself… and Tess starts to worry. Tess and her dog walk through the forest that stretches from their back yard, and run into a strange girl wearing old-fashioned clothes—and the girl is transparent in the sunlight. This strange girl has no memories of her life, her family, her identity—nothing. To ask other readers questions about Grave Error, please sign up. I’ll freely admit it – I was the kid who did NOT flock to the scary stories around the campfire, I don’t particularly like thrillers and suspense, and I will not (and have not) watched any scary movies. It’s been years since I could emerge unscarred from a King or Koontz novel, so I don’t even try anymore. Oddly, Majanka Verstraete’s Weirdville stories are JUST the right balance of creepy and scary for me, and my tolerance hits right in the middle of the 6 to 10 year old demographic, perfect rea I’ll freely admit it – I was the kid who did NOT flock to the scary stories around the campfire, I don’t particularly like thrillers and suspense, and I will not (and have not) watched any scary movies. It’s been years since I could emerge unscarred from a King or Koontz novel, so I don’t even try anymore. Oddly, Majanka Verstraete’s Weirdville stories are JUST the right balance of creepy and scary for me, and my tolerance hits right in the middle of the 6 to 10 year old demographic, perfect readers for this series. The common thread in this series is the town of Weirdville, where strange, spooky and scary things happen with regularity. Each book stands alone, and are perfect reads that give a feel of sitting around a campfire telling a spooky story. In Grave Error, Tess is walking her dog in the woods when she meets a girl in old fashioned clothes and no memory of who she is. Even stranger, this new girl is transparent! 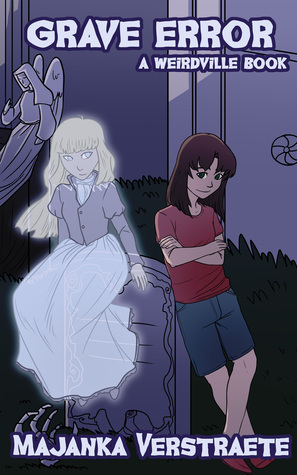 This being Weirdville, Tess instantly wonders if the girl isn’t a ghost, and since she can’t continue to refer to her as “the girl” she calls her Emily. Far from being too scared to help, Tess wonders if a trip to the graveyard might help Emily to discover who she is. Wandering in the graveyard, Emily points at a stone and says “there is evil there”, and even the dog, not at all afraid of Emily, gives that grave a wide berth. With some scary moments that nearly change Tess’s mind about helping Emily, they are able to defeat the bad spirit and find the solution to the mystery that is Emily. Verstraete gives her characters life and breath, these are kids who turn to one another and their parents for help in unraveling the mysteries: even if the parents are skeptical at first. These are not kids with superior skills or curiosity, they are aware of their own limitations but still want to find the answers. The twists and spooky moments are well placed and pepper the story with increased tension to the climax, never quite tipping over into nightmare territory. Wonderful stories to share with your children or grandchildren, and particularly well-suited for reading aloud. Suffering from boredom and a hot summer Tess discovers a ghost in the woods between her house and the grave yard. Tess’s dog likes the ghost. The ghost doesn’t know who she is. So even though Tess is scared she takes the ghost to the grave yard to see who she might be. The ghost tells Tess to stay away from one of the gravestones because it feels evil. Not knowing the ghost’s name they choose to call her Emily. Tess tells Emily she will help her find out who she is and Spooky, awesome and creepy. Suffering from boredom and a hot summer Tess discovers a ghost in the woods between her house and the grave yard. Tess’s dog likes the ghost. The ghost doesn’t know who she is. So even though Tess is scared she takes the ghost to the grave yard to see who she might be. The ghost tells Tess to stay away from one of the gravestones because it feels evil. Not knowing the ghost’s name they choose to call her Emily. Tess tells Emily she will help her find out who she is and what happened to her. Tess helps find out when the ghost lived, what her name is and how she died. They search the grave yard for her tombstone. The grave yard is scary and bad things happen. In the end Tess helps the ghost get rid of the evil ghoul and find her way home. The story was a little spooky and it was awesome. I really loved it because it was creepy.